As those who have been reading this have probably figured out, I’m keeping up this daily blogging thing. I’ve blown past the initial goal of 30 days uninterrupted – you’re welcome – and will be making this streak last at least until Easter. I’ve occasionally asked people for topics to help get the creative juices flowing. I don’t always run with them, but they can get me thinking along a specific topic. When I asked @TheInsaneRobin, I was expecting him to request an explanation as to why I get so much joy out of making light of Star Trek. (Answer: Because so many of their fans take the show, and themselves, too damned seriously.) You can imagine my shock when he requested a post focused on praising him. It seemed excessive to make a blatant request for a post extolling his virtues. I love him dearly, but he requested the equivalent of a Craigula post! But I was happy to oblige, mainly because I’ve come here not to praise @TheInsaneRobin, godfather of The Nerd Party, but to drag him. Remember, he asked for it. We wrote a series of gag blog posts for The Nerd Party where we had a fake falling-out over something like a movie opinion. It was complete nonsense, and we thought it obviously comical. We traded spirited jibes that were obviously overblown to the two of us; at one point I think I wrote that he was my “former friend.” Given that it was appearing on a blog that was for a podcasting network on which we both appear, we figured everyone was in on the joke. Turns out it didn’t go over terribly well, as people thought we were having a venomous falling out in public. That was a clear indicator to me that our collective ability to detect humor has been damaged by the Internet age. He pulled the plug on the joke and wrote a note assuring the world that yes, we were still friends. It was very magnanimously worded, but made it clear to the audience that he, @TheInsaneRobin, was not to be blamed. It was all the “work” of @kesseljunkie. He nurtured the idea of his innocent agreement to go along with my “terrible idea of a joke” (I’m paraphrasing), instead of revealing to the world that he was in on the gag from the beginning. I even asked him, “Do you think this is too far?” Since I keep the blog clear of foul language, I can’t use the exact words he did when he told me that I wasn’t allowed to back down. 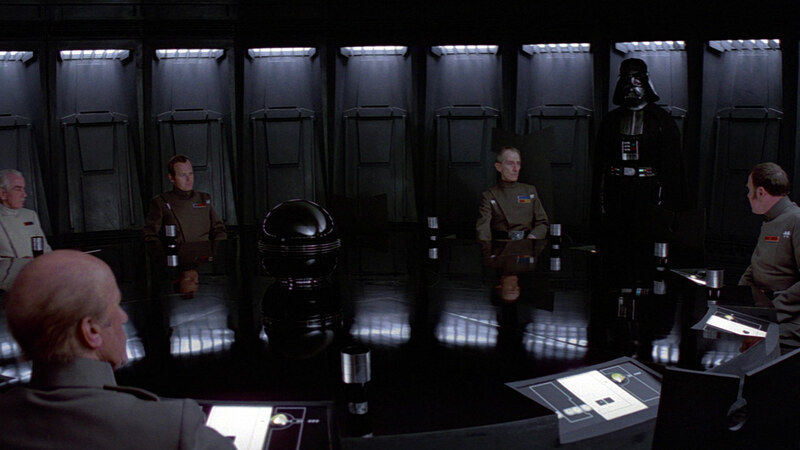 He moved in shadow like Grand Moff Tarkin, consolidating what power he can by manipulating the bureaucracy of The Nerd Party. I admired his brilliance, because I understood then that I’d been manipulated into taking the blame for his performance art. I also knew that the smartest thing at the time was to play along instead of risk his wrath. I’m writing about it now because the truth must be known. Dramatic reenactment of The Nerd Party conferring over what they thought of the latest trailer for a DC Universe movie. The veil of secrecy must be lifted! His intention to pursue the candidacy for President of the United States in the coming years is proof he’s become power-mad. I fear for all of us unless I speak out now. If we allow @TheInsaneRobin to become President of the United States, he will immediately begin hollowing out the Earth to build his own version of Starkiller Base! The first step in his diabolical plan was founding The Nerd Party, a global podcasting powerhouse, to capture the hearts and minds of nerds first. He knows that they are a malleable, impressionable base of people. He’ll convince them all to cosplay as him, while listening to a wide variety of shows. On two of those shows, he forces me to be a public face in his rise to power. He promised me a prominent place in his cabinet, but I know the truth now. He plans only to leave me chained in the basement of the White House while podcasting all the time. While that would be pretty fun and a dream job, his promise to leverage his vast power to force me to dress as the 1966 Batman while he throws ice cream at me is crossing the line. I wrote this gag post because this is what @TheInsaneRobin gets for his request to have a post about himself. This is what anyone would get if they asked for it by request. They should expect nothing less, and would likely be disappointed if I didn’t go down this road. He gets an exercise in sophomoric imagination run rampant. I had fun with it, and I hope you did too. I also took the opportunity to reuse his online nom de plume a ton of times in hopes of hijacking some Google magic. With any luck, the addled random searchers will end up reporting that he’s running for President of the United States. To go out on a positive note, I will say that @TheInsaneRobin is a dear friend. He’s got a great sense of humor and is willing to have sensible conversations, even with people who are oft less than sensible. I consider myself lucky to have crossed paths with him, and consider it a good fortune that he can tell when I’m kidding and when I’m not. He’s even good-natured enough to let it slide when those around him have been complete idiots. It’s a little known fact but, when I got in trouble with a Twitter mob about a bad joke, he was one of a very small number who refused to ditch, block, or disavow me. He quietly offered support and encouragement as I tried to make it clear that what I’d said was a joke, and not meant to be taken literally. I came within a hair’s breadth of quitting podcasting. I was ready to walk away permanently in the face of my public shaming. That’s not an exaggeration. I was about to quit podcasting, and he and another person immediately told me that they wouldn’t “let” that happen. They kept up a constant counter-pressure to convince me that it would pass, that they knew I was a good person, and that I was too good to walk away because some people don’t understand humor. I’ll always be grateful, because people who are willing to drive others out of a silly hobby, including the person who suggested I should commit suicide to prove the sincerity of an apology, aren’t people to whom you should listen. Those people are venomous and broken inside. But they’re also loud, and without a lot of support you can end up doubting yourself. @TheInsaneRobin was one of the very few who supported me. It was a moment that demonstrated what a stalwart friend he was. I have always appreciated his friendship, but I learned to appreciate it even more going forward from that moment. I’ve even had the good fortune to see him in person twice! Here’s hoping we get to see each other in person more often. It’s always a good time with a great friend. P.S. Just to be clear, the thing where we had a mock falling out where people took it seriously did happen. But it was a completely organic and fun experience until people didn’t catch on that it was a joke. Which shocked us both, but he handled it well. You may not understand why this is a picture in this blog, but @TheInsaneRobin does.